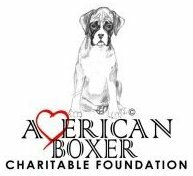 The American Boxer Charitable Foundation is a non-profit 501(c)3 organization and donations are tax deductible, in accordance with IRS regulations. Below is a summary to the ABCF and ABC of the research accomplishments in study of degenerative myelopathy (DM) over the past year. I would like to especially acknowledge the ABCF and ABC for the continue support of the research through grant funding and donations. We continue to move forward with the grant funded by the AKC Canine Health Foundation through the ABCF entitled, Biomarker development in canine degenerative myelopathy for diagnosis and longitudinal monitoring of a therapeutic approach. We have identified potential diagnostic marker, which will assist with the early diagnosis of DM. We have established a biomarker test that will assist with determining a diagnosis for degenerative myelopathy. DM is a diagnosis of exclusion, meaning that veterinarians must rule out all other diseases that mimic it before coming to a final diagnosis. This requires expensive diagnostic procedures such as MRI of the spinal cord. Now that we know that DM and Lou Gehrig's disease (ALS) are related, we are studying ways to diagnose and measure disease progression with similar diagnostic modalities used in ALS patients." Canine DM is an older adult onset disease that will eventually lead to paralysis. Since the genetic mutation is only partially penetrant, the genetic test for DM is useful to breeders and veterinarians to screen for presence of the mutation as a risk factor in dogs developing DM but has limitations for diagnosis DM. The risk mutation for DM is widespread and common among companion dogs. A definitive diagnosis of DM is only by autopsy and histopathology. Pembroke Welsh Corgis, German Shepherd Dogs, Boxers, Chesapeake Bay Retrievers and Bernese Mountain dogs are among the 30 pure breeds as well as mixed-breeds histopathology confirmed for DM in their breed populations. A biomarker test used to diagnose ALS is measurement of phosphorylated neurofilament heavy proteins (pNF-H) that are contained within axons. Degeneration of the neural tissues and axonal damage causes release of pNF-H into cerebrospinal fluid and blood of ALS patients with disease progression. Thus, pNF-H has been shown to be a useful biomarker of disease in diagnosis of ALS. Dr. Coates collaborated with Dr. Michael Garcia, a neuroscientist and an associate professor of Biological Sciences at the MU Bond Life Sciences Center, to evaluate whether the diagnostic tool also could be useful in dogs affected with DM from disease diagnostic and monitoring progression standpoints. Cerebrospinal fluid and blood samples were collected from DM-affected dogs, including dogs that had a confirmed diagnosis as well as dogs in early stage disease. pNF-H concentrations from those samples were compared to samples from age-matched normal dogs and dogs with mimicking diseases. We found a significant difference in the DM affected dogs with increased pNF-H in the cerebrospinal fluid of the DM-affected dogs relative to the control groups, indicating that the human ALS test could be used to diagnose DM. These results will enable us to 'scale up' the test to make it more accessible to veterinary community. Although collecting cerebrospinal fluid from patients is more complicated than a blood test, it is less expensive compared to an MRI to make a presumptive DM diagnosis and may serve as another diagnostic tool for diagnosis of DM. We also continue to evaluate neuroimaging through MRI and electrodiagnostic techniques in monitoring DM progression. 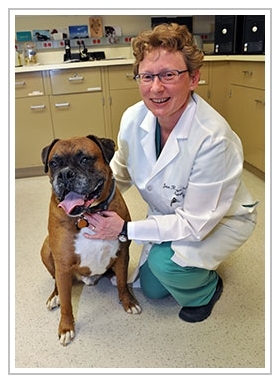 The Boxer is one of the breeds that the studies are focusing on for histopathologic studies. We are still in need of CONTROL tissues that represent older Boxers (> 9 years) that pass from another disease process and considered to be neurologically normal. Through finding the associated mutation in a protein called superoxide dismutase 1 (SOD1), we now have a target for therapeutic study. We continue to evaluate a molecular approach using antisense oligonucleotides to halt the production of SOD1, which may slow DM progression. This has been shown in transgenic ALS mouse studies. This study is being funded by the NIH/NINDS. We are studying the therapy as a randomized, double-blinded, placebo control study. This is the best way to evaluate therapeutic efficacy. The same therapeutic approach also will be underway in human patients also with SOD1-associated ALS. After completion of additional safety studies, this study is now underway and we need dog participants. The main inclusion criteria are Boxers in the early disease stage and within driving distance to receive monthly treatments. We also are pursuing a gene therapy study, which is now underway and are recruiting dog participants. The study is being funded through the ALS Association (ALSA). The treatment involves a one-time injection into the spinal fluid and follow up at 1 month and every 3 months thereafter. Again, the main inclusion criteria is that the dogs need to be in the early disease stage. I also have a PhD student who is studying the neuroinflammation associated with canine degenerative myelopathy. Accurate knowledge of neuroinflammation characteristics in relation to disease stage will be vital to test the ability of potential anti-inflammatory therapeutics to slow or halt the disease progression. This project was moved forward by Joyce Baker-Brown and received funding through the Million Dollar Roundtable Association (notification still pending) with her platform as Man and Man's Best Friend, In Pursuit of One Dream to cure ALS and DM. Dr. Coates continues to study DM through tissue collections and archiving those tissues so the disease can be researched also by other DM and ALS research groups. The ABCF has kindly donated additional funding to enable the archiving to be continued. Coates JR (Co-PI), Moore SA (Co-PI), Faissler D (Co-PI), London CA (Co-I), Olby NJ (Co-I), Griffith E (Collaborator). A platform trial design to accelerate translational therapies in a canine disease model of ALS as submitted to funding opportunity announcement PAR-16-343 (Exploratory CTSA Collaborative Innovation Awards R21). We have formed a new multi-institutional CTSA-linked collaborative enterprise that includes board-certified veterinary neurologists with expertise in canine DM, a community of ALS researchers, and industry entities with the shared long-term goal of conducting comparative veterinary clinical trials in canine neurologic diseases as a mechanism to inform and enhance translational medicine. As such, the overarching purpose of this proposal is to develop an innovative neurotranslational platform clinical trial framework and use this to conduct evaluate novel adeno-associated virus (AAV) gene therapies targeting SOD1 (AAV.iSOD1) in canine DM. This will be accomplish by first establishing a collaborative platform to conduct clinical trials in canine DM and then using this mechanism to test the therapeutic efficacy of intrathecal (IT) administration of AAV gene therapy to silence SOD1 production in affected dogs. Specifically, we will create a permanent infrastructure to administer a perpetual platform trial and develop a universal DM "patient" registry that will capture and archive longitudinal veterinary patient data and standardize trial enrollment, randomization and reporting. Members of the network will develop consistent procedures for patient assessment, establish clear parameter regarding outcome measures, explore emerging biomarkers to enhance go/no-go decision-making and bank biospecimens to enhance performance of future studies related to DM. This research explores brain function and a receptor known to be affected in ALS. We will longitudinally follow DM participant dogs using this diagnostic marker. Sah D (Co-PI), Coates JR (Co-PI), Johnson GC, Govindarajan R. Development of an AAV Gene Therapy Targeting SOD1 for the Treatment of ALS -- Translation of Delivery. The ALS Association TREAT ALSTM Drug Development Contract. We will be using a gene therapy approach to treat DM affected dogs. This project is in collaboration with a company that focuses on treatment approaches for neurodegenerative diseases. Ivansson EL, Megquier K, Kozyrev SV, Muren E, Baranowska-Korberg I, Swofford R, Koltookian M, Tonomura N, Zeng R, Kolicheski AL, Hansen L, Katz ML, Johnson GC, Johnson GS, Coates JR, Lindblad-Toh K. Variants within the SP110 nuclear body protein modify risk of canine degenerative myelopathy. Proceedings National Academy of Sciences U.S.A. 2016;113(22):E3091-3100. Lovett MC, Coates JR, Oglesbee M, Fenner W, Moore SA. Quantitative assessment of HSP70, IL-1β and TNF-a in the spinal cord of dogs with E40K SOD1-associated degenerative myelopathy. The Veterinary Journal. 2014; 200(2):312-317. When provided the opportunity, she lectures on canine DM at veterinary CE, research meetings and breed clubs. She also is invited by the ALS Association to share her research on canine DM in order to enhance collaboration and open doors for shared therapeutic approaches. Dr. Coates continues to build collaborations with other veterinary and ALS researchers. Through study of DM, she is able to open collaborations with ALS researchers who are investigating therapeutic approaches for ALS. Hopefully, canine DM as a disease model for ALS will help treat DM and ALS. The progress of DM research is only made possible with the support of the ABCF and ABC. I wish to thank all the members. I also want to thank all the companion animal owners, breeders and the dogs who have given their lives so more can be learned about DM. I will always be grateful for the support.